After bringing together P Jayachandran and Vani Jayaram in 1983, director Abrid Shine goes one up in Action Hero Biju, getting Yesudas and Vani Jayaram to sing a duet, and a composition from another veteran Jerry Amaldev! Returning to film-composing after 13 years (his last one was Saudamini in 2003), the man takes you back to his prime with the gorgeous melody that is Pookkal Panineer Pookkal. The retro arrangement features a profusion of violins, especially in the interludes. More yesteryear feels follow with Chinmayi’s solo act Oonjaalilaadi Vanna, composer going for a ghazal flavour here. The tune has mild heard-before quality to it though that doesn’t particularly affect the song’s appeal, thanks to Chinmayi’s brilliant singing and the orchestration (conducted by yet another old-timer, C Rajamani) once again dominated by violins (Chennai Strings), and tabla (Prasadh), with the occasional cameo by Saroja’s dilruba. The first half of Chiriyo Chiri evokes a mild O P Nayyar feel, what with the horse-cart rhythm and all (that first interlude sounds straight out of old timey Bollywood), but is engaging all the same. Behind the mic are Vaikom Vijayalakshmi and Vineeth Sreenivasan, the latter not quite sounding his best. Amaldev’s final song is the only one that lands off the mark. Hari Narayanan’s lyrics seem to imply an ode to the police (or it could just be to the protagonist), but the whole composition comes off rather average, even Suchith Suresan’s energy doesn’t help much. The final song is composer, written and sung by V Suresh Thampanoor – a very simplistic song titled Muthe Ponne Pinangalle that lasts all of a minute and forty seconds, but will win you over with just that. It also helps that the song came out as a video, has a really joyful vibe about it. 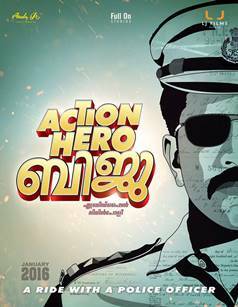 Action Hero Biju. Kudos to Abrid Shine for bringing back Jerry Amaldev. The man proves that he is far from done, hope to hear more from him. This would seem a good time to have made a return in fact, given the increasing love in the industry for the bygone era.